If you, as any class, pick up a 2-handed sith lightsaber, it goes invisible, but is usable. It can be used to both block and attack. Blocking incoming shots will use up force/jet fuel, which every class has available, underneath the current gold amount. The lightsaber uses the standard mod animations for both attacking and blocking. For the person using the glitch, the blocking animation cannot be seen, as your character simply uses the 'fist' block, but directional blocking still works in a melee fight, and is still visibly to others as you blocking in individual directions. Aside from the fact that non-force users can use the lightsaber, it goes invisible, making killing the person using it particularly difficult. The character seems to try to switch weapons, where the animation for switching weapons will appear. This makes the lightsaber ineffective for a split second, letting a stray melee hit or a well-timed blaster bolt hit the user, before the game switches the lightsaber back into the hand of the person using it. It can be described as switching between the lightsaber and your fists in 0.3 seconds or so, only you do not do anything, it happens automatically, and repetitively after a certain amount of time. In some cases, if a non-force user pick up the lightsaber, and drops it (by pressing G) the lightsaber will appear visible and activated on the ground. If it is then picked up and dropped a few more times, it becomes a green lightsaber for some reason. Easily replicable, testable and usable by everyone. Happens accidentally in many cases, by someone picking up the wrong item. Description of Bug/Glitch: Several times while fighting sith players with the double bladed lightsaber, their lightsaber and right arm would dissapear from my view leading me to death. On two occasions the player i was fighting simply vanished from sight and killed me while i stood there bewildered. It also happened to me whilst fighting a magna guard. I'm not sure if this was on my end but thought it was useful to put it here incase other people experienced it. You can look through the electric end things and see troopers but no jedi robes on jedis (only their head and hands). I played with some other guys with 40 bots in the first team and 50 bots in the second team. And I got some visual bugs like a cut off screen. Bugs added to the bug fixing list on the Road to 1.0, visit our Trello(work in progress) for more information. Except Neyth's report, I think that has something to do with terrain borders, and might be user related. I'll give more info when I check it out. Please continue reporting all bugs/glitches you can think of(even the obvious ones) if you don't see them on trello. In high ping or lag, scrolling backwards to equip a shield with no weapon/item in the 2nd hand after having a blaster equipped sometimes causes you to be unable to move. This is highly annoying, and often leads to death, as you are usually taking constant fire when the glitch occurs. Equip your blaster, right click once to bring the gun into 'aim' mode. Right click again to lower the gun. The fix is immediate if successful. Does not work 100% of the time. From my experience, if the error code for quickswitching occurs in chat (See post below), you will not be able to fix your situation, in which case, may you rest in peace. The rest of the time this is a quick way to escape your impending doom. Does involve unequipping your shield, which may get you shot to pieces, as one often uses shields when pushing in the open, or in an exposed position. Error code that occurs after switching between weapons too fast. 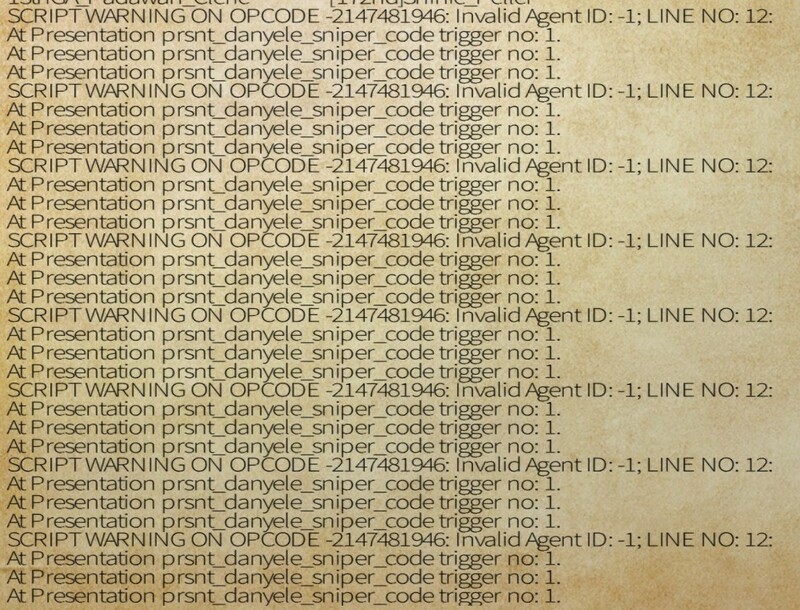 Can sometimes happen for snipers, sometimes creating a wall of text in various sizes. I know the fix for that bug. Don't quickswitch. Btw can we make it so whenever you get this error your game crashes? Im sure you follow Hawk's proposed rule that you're not allowed to shoot 2 seconds before or after switching weapons, or switching to the shield. If anyone(preferably 2 players on a real server) could do a proper testing of what's up with the medic packs and do a nice bug report with the occurences and causes I'd be very thankful! I can have someone check it out with me, tho i am unsure whether there are any at the moment. Ianitori provided some elaborate examples on the Discord. Try him. Player 2 picks up said medpacks, the amount increasing by 6. Player 2 picks up said medpacks, the amount increasing by 6 again. So one needs either a large amount of people spawning without medpacks in a battle round, or a constant stream of cooperative companions in a deathmatch round, all of which also spawning with no medpacks. Basically if you were to use it in a battle round, you could only have as many medpacks as the total player amount on your team could have taken had they all spawned with their individual sets. This assuming the entire team are troopers. Had there been force users, they would also be able to do this with troopers. In battle there is no significant advantage in doing this, other than collecting a large amount of medpacks in one spot, with only one medic, which then leaves open the opportunity to constantly shoot others, instead of multiple people having to heal their team. The downside here is that if the one medic with all the medpacks dies, without having had those medpacks in his hands, that team has now lost all healing capabilities. Quite a weird bug, a tad unprofitable, but still applicable in events. I believe it works with other items such as grenades and detpacks, although i have not personally tested this. I assume it has something to do with M&Bs ammunition system. Each player has a total amount of medpacks possible, purchasing medpacks in equipment store will unlock these, but picking up another set would then double the amount you could have. Having the medpacks of another player then 'unlocks' the amount you could have had. Fixing this is for the accomplishment of better men than i.